Photograph, signed, inscribed and dated "To Mr P. D. Hinder. Arthur Rubinstein, London. 27.5.36". With the stamp of Marcel De Valmalete, Organisation Artistique International, Paris on verso. Approx 9.5 x 7 inches (24 x 18 cms). Some slight surface damage to lower right white border (not affecting image) and with slight marking and mounting traces to verso. All else in fine condition. 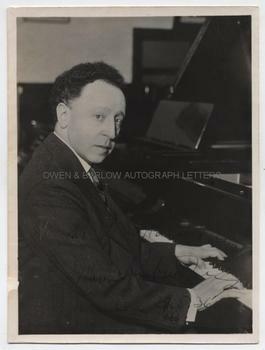 A fine portrait photograph of Arthur Rubinstein seated at piano. 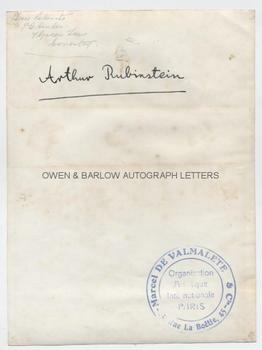 This photograph was signed by Arthur Rubinstein in London where he had been making recordings of Chopin with Sir John Barbirolli and shortly before he commenced his 1936-37 tour of the United States, which was to be turning point of his career. There he was to cement his reputation as, arguably, the greatest pianist of the 20th century and one of the great pianists of all time.